Back on track. Sort of. The Historical Sew Fortnightly have been sadly neglected, but it occured to me that I could still make challenge 12, so I did. I also cleared away the sewing machine again when I was finished. All on the same day. That's quite something! The challenge was to create something that helps create a silhouette or otherwise shape and support body and/or garments, and since I wasn't happy with my last attempt at a bumroll but instead continued to use a borrowed one with my venetian gown I figured that would be perfect. 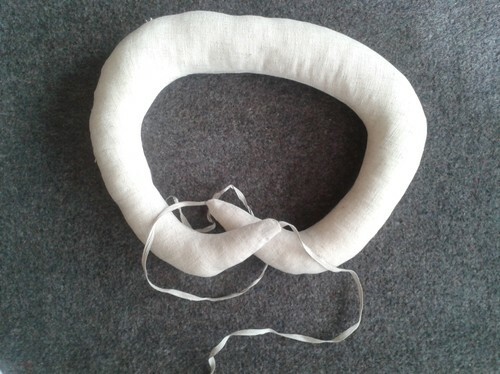 I used the borrowed bumroll for measurements, rather than my Tudor tailor pattern. In hindsight, I should have used the TT pattern with the measurements from the borrowed one. Now the result is suprisingly pretzel-like -but it does seem to work when it's tied on. Apart from making it narrower, I stuffed it a lot harder since the good thing about a bumroll is that it takes a bit of the weight of the skirts off my shoulders. Provided it's not a fluffy cushion. Awh well. Not my best project, but not my worst either. I'll likely make yet another one later and hopefully improve the shape. This will do until then. Notions: Linen ribbon, thread. Stuffed with the stuff you use for cushions. How historically accurate is it? : Model ought to be, materials isn't, machine sewn. 50% tops. Total cost: Nothing, all was scraps and leftovers from other projects.